LONDON, Sporting Alert – Arsenal are the in-form team at the moment and the English Premier League side showed it on Tuesday night with a 2-0 victory over Bayern Munich in the Champions League. Olivier Giroud and Mesut Ozil scored in the second half to guide Arsene Wenger’s side to victory, while handing Bayern Munich its first loss since August. It was also the first time this season that Bayern Munich were failing to score a goal in all competitions. But despite the win, Arsenal still sit outside of qualifying spots from Group F, after Olympiakos beat Dinamo Zagreb to go second behind Bayern Munich – with both clubs on six points. Arsenal went ahead in the 77th minute when goalkeeper Manuel Neuer failed to handle a free-kick floated inside the box by Santi Cazorla, which allowed substitute striker Giroud to head home into the back of the net from close range. Ozil added another in the 90th minute after Hector Bellerin picked him out and the German beat his fellow countryman. Initially, the ball was pulled back out of the goal by Neuer and then fired over by Alex Oxlade-Chamberlain, but the assistant behind the goal made the signal to the referee that Ozil’s strike had indeed crossed the line. “We did well until the goal and defended really well,” Giroud told BT Sport. 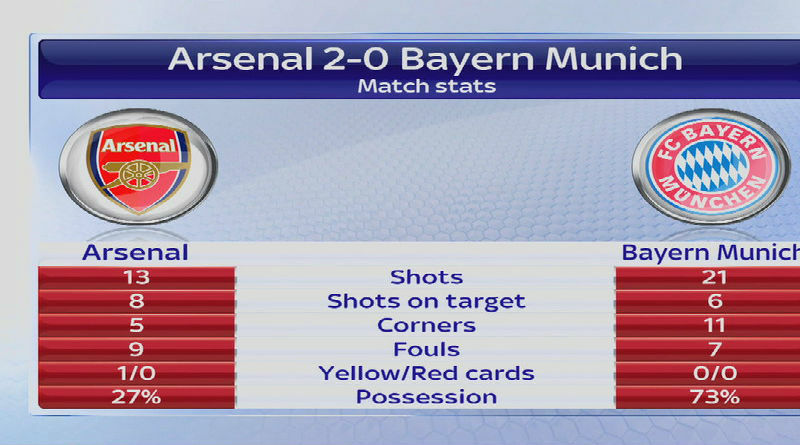 “Bayern Munich will have the ball, they are very good in possession and they finish with 70% of the ball. Giroud also praised goalkeeper Petr Cech for an outstanding performance after the former Chelsea shot-stopper pulled out a number of impressive saves. “We needed this win to stay in the Champions League and try to qualify for the next stage. We have to thank Petr Cech too – he had a fantastic game,” he added. Meanwhile, the other English Premier League side in action on the day, Chelsea, failed to score in a 0-0 draw at Dynamo Kiev. Eden Hazard returned to the starting lineup, but the Belgian was unable to help the Blues to three points. Jose Mourinho’s men are third in Group G with four points after three games. The Portuguese coach played the blame game for his team’s failure to win. “The referee was weak and naive with the penalty. I cannot understand what the referee behind the goal does because he doesn’t make a clear decision too,” he said, according to BBC Sports. Elsewhere, defending champions Barcelona, through a brace from midfielder Ivan Rakitic, beat BATE Borisov 2-0 to stay top of Group E, even without Lionel Messi.